Become a member today. Grow with confidence. The daily weather assessments include comments about rainfall that occurred overnight or during the weekend and how that and temperatures likely impacted crop and field conditions. The daily assessments also provide a very detailed two week weather outlook for each production region in the world. The daily forecasts are updated six days a week and can sometimes lead the market into different directions. No first rate weather service company can exist without consultation services. Weather impacts world commerce every day of the week all year long and the impact of weather can be quite traditional or very unusual. Our team of expert meteorologists can provide collaborative services for any individual or business no matter what the interest is. By far, the single most important part of the weather services that World Weather, Inc. provides is its special weather situation stories. These are weather issues that will drive long term commodity prices and will determine future trends in crop production and basic supply and demand. "I have been a subscriber of the services provided by Mr. Drew Lerner, since last five years. I am totally satisfied with all the valuable services provided by him. World weather has proved a boon for our business. The over all report of Indian Monsoon provided by World Weather has been proving 95% accurate each n every year. Satisfied by these kind of services I have continued the services, and am willing to do so till I continue with this business. I thank Mr. Drew Lerner for such valuable and accurate weather forecasts for India. Thank you." "We just want to say that we knew something was coming by your reports and we had everything anchored down, augers facing into the wind or in shelter of trees, bins closed, buildings shut, even trampolines anchored. Everything was prepared if and when it hit. We were just coming in from the field when the actual storm hit so we were as prepared as we could be. If it were not for you we would have been caught blindsided." "…your insights are definitely valuable to me!" "Thanks for the great forecasts. Funny how all other ones up here in Canada vary off the start from yours but eventually come around to what you forecasted from the beginning." "We really enjoy world weather. Don’t know how we did without it!" "We have indeed found the service you offer to be of great value. This is the first year in very, very many that we have "swathed" (vs straight-cut) our "hopefully" malt barley because of the large number of greens. Had we not been receiving your report with it's very informative, longer range, farm related narratives we would probably have left it standing, waiting on the greens and quite likely losing the riper heads in the process - your report made that decision a lot easier to make." Kansas City, July 27 (World Weather Inc.) – East-central Australia is still suffering from chronic dryness. Unirrigated areas of Queensland and northern New South Wales have been critically dry for an extended period of time and with El Nino possibly evolving later this year or in early 2019 there is concern that drought conditions will become much worse before they get better. 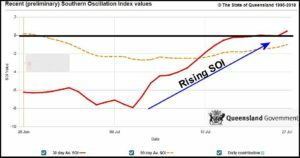 The Southern Oscillation Index (SOI) is possibly offering a little short term hope for the region after being consistently negative earlier this month. A notable rise in the SOI since July 10 has left some potential that August rainfall will be more normal than that of recent months. Sorry. There are no events available to view at the moment. Please try again later.